The Wellness Recovery Action Plan or WRAP, is a self-designed prevention and wellness tool that you can use to get well, and stay well. 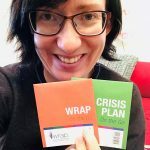 WRAP is for anyone, any time, and for any of life's challenges. Read More . . . These tips will save you time and help you navigate our website. As we’ve been updating and re-releasing WRAP books and other materials, you’ve no doubt noticed some adjustments and enhancements to the materials. The WRAP Info Center is the place to look for answers about WRAP. What is the Info Center? It is a collection of articles, forms, and information all arranged in a logical, searchable library. Visit the WRAP Info Center and find out more.